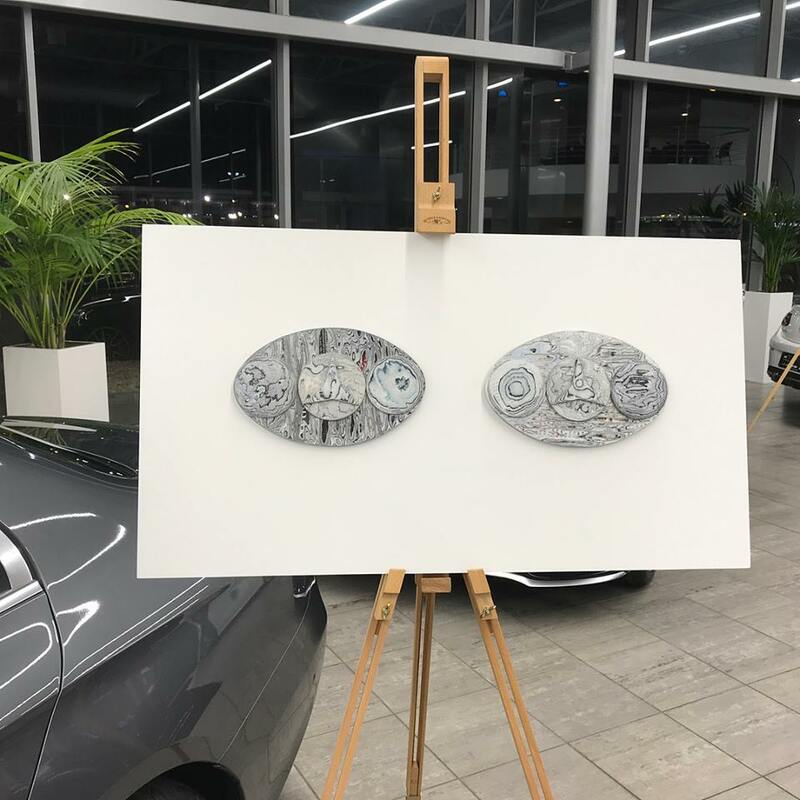 Made from recycled Mereceds-Benz brochures, this piece depicts headlights shaped in response to the 1916 Mercedes logo. Great workshop with lovely participants today, we spent a very Creative day at Beeston with Inspire Nottinghamshire Libraries some brilliant signs and brooches made! I am very excited to announce that on my return from my holiday, I received the amazing news that I was the Gold Winner in the Ecocreate 'Masquerade' Exhibition. What an incredible start to 2018! The aim of the exhibition is to promote the issues affecting the environment through a series of upcycled and eco-friendly artworks. The exhibition will run from 8th January until 26th January 2017. Public access to the exhibition Mon – Friday 10am – 3pm - Recommend calling ahead to guarantee access. Private viewing outside of these times will be held by appointment. 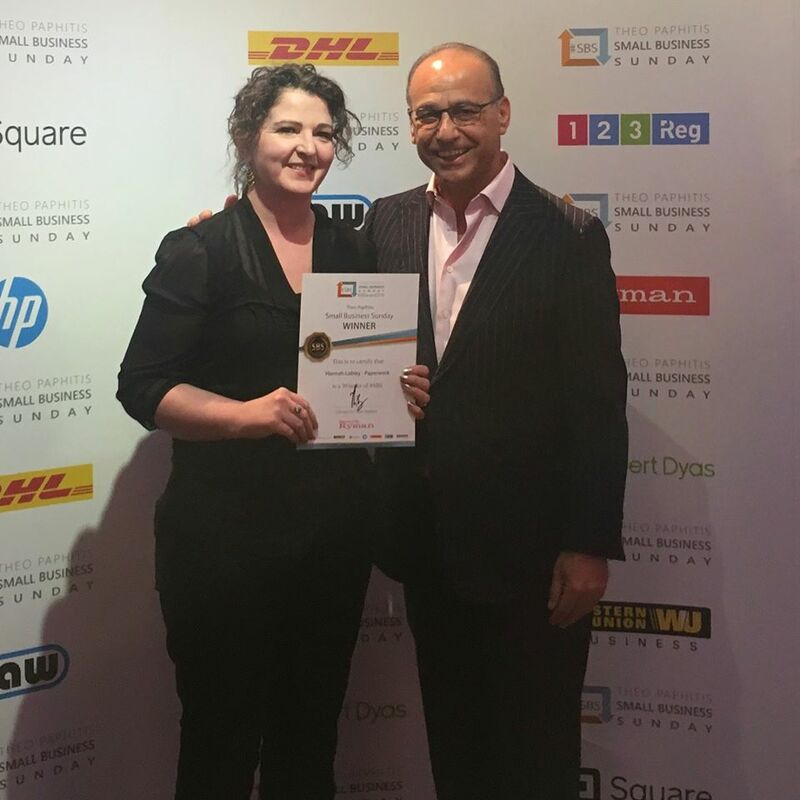 A Derbyshire based firm has received a business boost from Retail Entrepreneur Theo Paphitis. 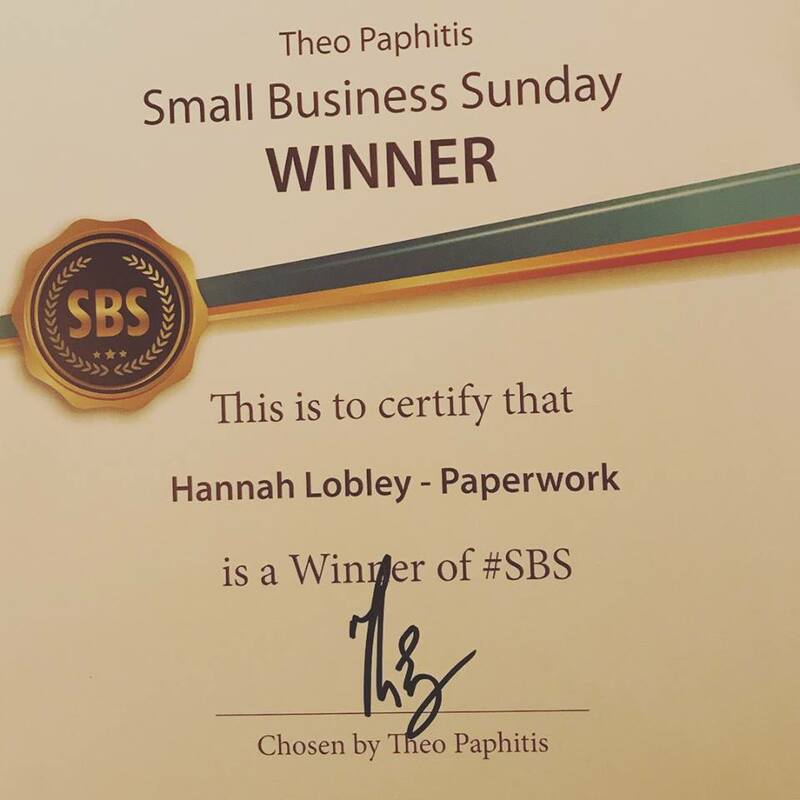 Last week, Hannah Lobley owner of Hannah Lobley - Paperwork tweeted Theo about her business during ‘Small Business Sunday’ and was one of six weekly winners to gain a retweet by Theo to his 500,000 Twitter followers. The weekly initiative, set up by Theo in 2010, now has over 2000 #SBS winners and supports small businesses in the UK. Business and retail entrepreneur and self-confessed Shopkeeper, Theo re‐tweeted Hannah’s message to his almost 500,000 followers. Hannah’s new products for 2018 will be profiled on the #SBS website (www.theopaphitissbs.com) that is exclusive to all Small Business Sunday winners. 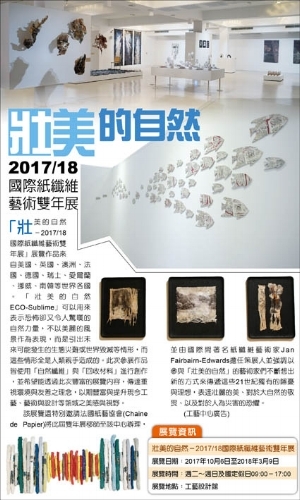 Paperwork has been in the Taiwan Press as part of the Eco- Sublime exhibition below. The Association Paper Chain is pleased to have the opportunity to present the work of 46 International Artists at 2017/18 Fibre Art Biennial event in the large CRAFT DESIGN HALLS of the NTCRI Campus Nantou County Taiwan. A Paperwork installation, consisting of 62 recycled paper fish will be part of this Paper & Fibre Landmark Biennial Project. An environmentally friendly Eco sustainable event using natural or recycled materials.The first exhibition: natural handmade paper or recycled paper;The second natural fibre, man-made recycled fibre. 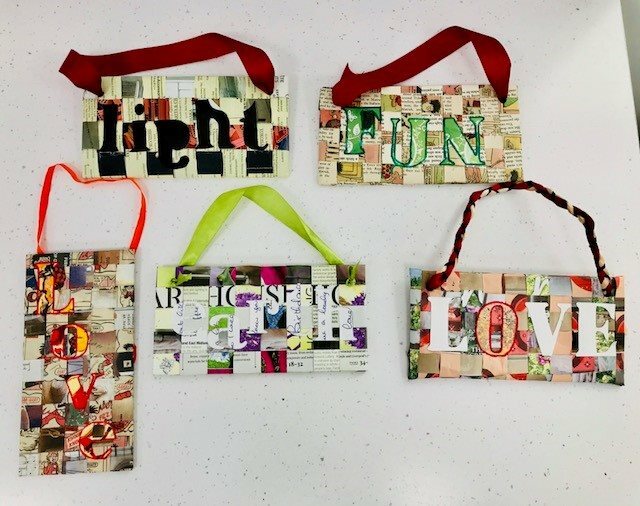 Work with Hannah to transform your old paper magazines and books into bespoke interior décor signs. In 2002, Hannah Lobley developed the award-winning Paperwork; a unique recycling technique using unwanted paper layered back into a solid wood like material. She uses traditional wood working methods to create bespoke objects and the surface patternation echoes wood grain. Wood becomes paper becomes wood. Perfect timing for Valentines Day. Why not make a LOVE sign for your partner or family member to treasure and hang in their home. 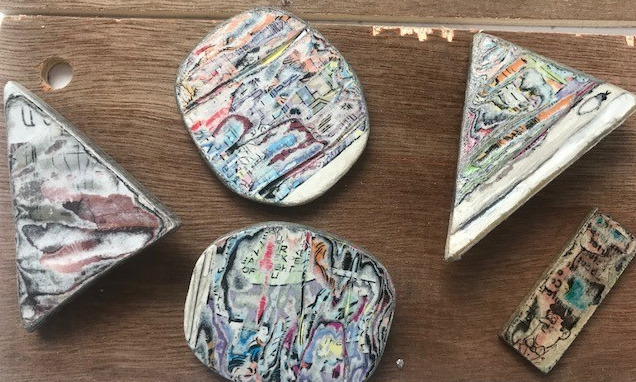 As well as exploring the paperwork process from scratch to make your sign, Hannah will also bring along some pre-dried paper for you to work with and create a shaped brooch. This workshop is ideal for beginners. Open Studios at Banks Mill is open once a year to the public, and this year it will be open on Friday, 24 November 5-8pm and Saturday and Sunday, 25 & 26 November 10am-5pm. You can meet artists in their working studios and buy or commission original artwork and handmade products direct from the artists themselves. The studios will be open from 10am-5pm each day and work on show will include fine art, contemporary glass art, ceramics, jewellery, screen printed fashion design and accessories, mixed media art, textiles and upcycled garments. Free car parking can be found at the Enterprise Centre, just a minute's walk from Banks Mill along with pay and display on street parking in the surrounding area. Don’t miss MELBOURNE FESTIVAL 16th & 17th September 2017 10am – 5pm. During the Art & Architecture Trail visiting professional artists are hosted in rooms made available in private houses, which are not usually open to the public. Entry is with a £5 Trail Guide features lists of venues with the name and speciality of the artists and their contact details. All of the work on the Trail is original, for sale and the artists and makers all accompany their work and many demonstrate their skills. There will be paintings, photography, pottery, sculpture and jewellery – in fact something for every taste and pocket. Each year we feature a mix of new artists and lots of old favourites. Me and my Paperwork products will be in ‘The One Off’ on Derby Road, DE73 8FF. Bury Art Museum has a video up from Transition festival on the EU Museums in Short website and needs your vote today please! Featuring a whole load of incredible artists ; Ali Bell (Mother), Dean and Kevan (O>L>A), Dan Hall, Kahedra, Hannah Lobley, Anna Columbine, Anita (Sew What Mcr) Natalie Lee, Rose Holt, Caroline Coates, Holy Cross students and models, Elms Bank, Gina Warburton, many BAM staff and many of our regular visitors. The themed evening was curated by Jennifer Wright with Gina for Transition Festival 2016. Filmed and edited by Paul Wright. Voting closes 15th July, so it would be great to get as many in as possible. The video is only a few minutes long and takes two minutes to vote for – easily done over a quick brew. I will taking a break from the studio for the Easter Holidays from Friday 7th - Monday 24th April 2017. Please use the contact page to leave me a message and I will get back to you as soon a possible. I am very pleased to announce that Hannah Lobley Paperwork has won 'Best Recycled Art Design & Installation Company - UK' & 'Best Sustainable Design Installation Project: Harness the Wind' at BUILD 2017 Interior Design Awards. Paperwork is currently on show in an exhibition at Bury Museum and Art Gallery. This exhibition presents a selection of work from Hannah and two other designers who create exceptional works with paper. Madebyhandonline.com is dedicated to promoting high quality British Contemporary Craft. They are a small team behind the scenes, based in Devon, working within the Craft industry with and for their makers. The website brings together a whole community of selected makers from around the UK and they use the site to celebrate this work and sell directly to the public - online. I am really happy that a brand new Paperwork piece, has been selected along with work from 104 Derbyshire based artists, to exhibit work in the Derbyshire Open Arts Competition 2016. The exhibition is being held at the Buxton Museum and Art Gallery from Saturday 25 June to Friday 2 September 2016. The Derbyshire Open Exhibition is an annual highlight for Buxton Museum and Art Gallery. Professional and amateur artists of all ages, were encouraged to submit work for consideration by a panel of independent judges. For more information please follow the link. "I can remember seeing Hannah’s work for the first time when she applied and successfully got a place at The Contemporary Craft Festival. She was at the beginning of her career and it was clear that she had great ambitions and had developed an innovative approach to making. I really like the origins of her story. In 2002, accidentally leaving a copy of the Lord of Rings out in the rain resulted in bloated damaged pages. The metamorphosed book sparked an idea that has endured throughout her practice. She was initially working with wood but when the destroyed book became solid with layers of paper, she decided, after some manipulation of the material, to put it on the lathe. The resulting “Ring” made for the Tolkien novel was her first sale. Reclaiming old books and papers is at the heart of her practice. She has turned traditional notions of materials on their head and has had great success with international markets, especially in Japan. 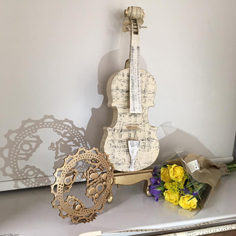 The Japanese are drawn to her creative use of paper and her ethos of using disposable objects, turning them into durable and evocative objects. Her first trip to Japan was in 2007, with a trade mission with UKTI, Design Factory & the Arts Council and she has been commissioned numerous times by large corporate clients and even the Ministry of Defence. 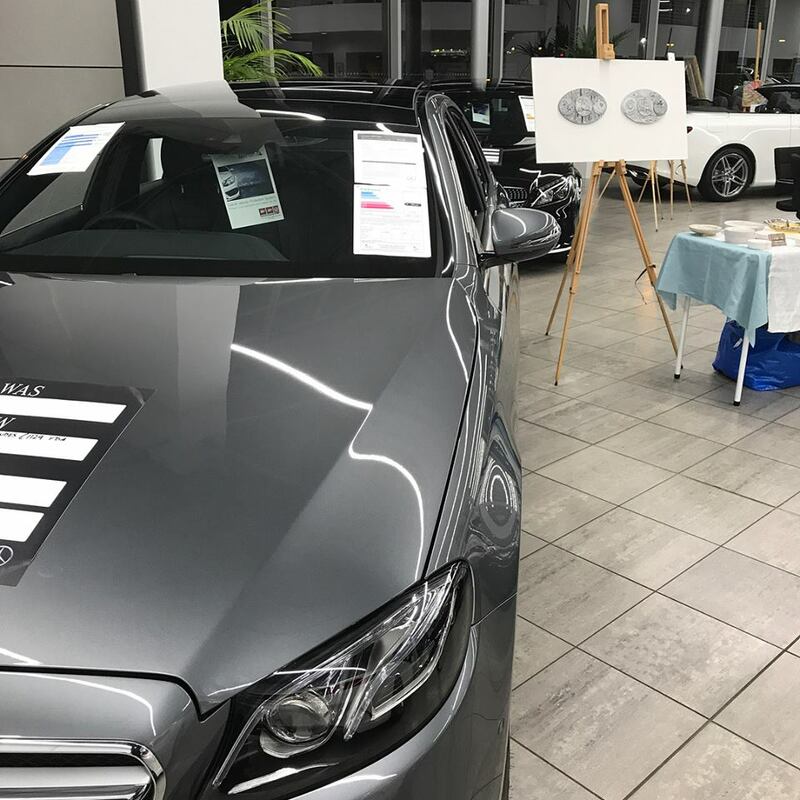 I’m interested to see how she has developed her practice to be able to work on commissions for corporate clients which requires good organisational and diplomacy skills whilst allowing her to be more ambitious with scale and ideas." Hannah is currently working on new pieces for an exhibition at the National Centre for Craft & Design in May. This exhibition presents a selection of Design Factory and Design-Nation members who create exceptional works with paper.